I think they should rename it “Lotus VB6time” because, well… see for yourself. I can see the sales droid selling this now, invoking adjectives like “minimalist” and “rugged.” It doesn’t matter what it looks like as long as it works, right? Right? I’ve got a lot of background processes running and killing my disk performance with all the I/O they’re doing. 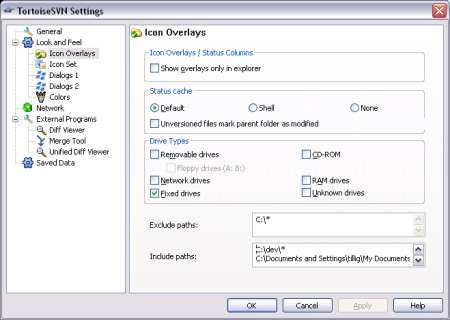 One of the primary offenders is the TortoiseSVN cache that helps put the icon overlays in Explorer. Several folks I know disabled the cache altogether, but I like the icons. In the tree view, find the “Look and Feel/Icon Overlays” branch. In the “Exclude Paths” box, put C:\* to exclude the entire C drive. If you have more drives than that, exclude them all at the top level. Separate the values by newlines. Either reboot or open Task Manager and kill “TSVNCache.exe” so it restarts when needed. You have to restart it for these options to take effect. After I did this, the icon overlays still worked great but the disk I/O went down to nearly nothing. YMMV. I just did a quick peek at my feed in RSSBandit and it looks like my images aren’t showing up in my feed. Turns out it’s because, in many cases, I specify image URLs as “/path/to/image.gif” rather than “http://www.paraesthesia.com/path/to/image.gif” - relative rather than absolute. I’m looking into ways to fix this in an automated fashion. I don’t want to have to manually go back and edit every post that has an image in it, and I’m sure there are links that are also specified in relative format that won’t work in feeds. I found a WordPress plugin that does exactly what I need for exactly the same reasons. I just need to find a .NET HttpModule that does this (that I can selectively enable just for the feed). If I can’t find it, I guess I’ll have to write it. Saturday was my second laser hair removal treatment, and I won’t lie, I was worried. Since my first treatment four weeks ago, I’d discovered that there’s really no such thing as permanent hair removal - it’s more permanent hair reduction. I started questioning whether it’d be worth finishing, considering the cost and pain involved. On that point, I figured less is still more; I’ve destroyed too many pillowcases with this beard and it causes me too many skin issues, so any reduction is worth it. Also, there was the issue of pain. I’d had half of my neck done with a MeDioStar laser and it was literally the worst pain of my life. The rest of my neck and face were done with a Dermo Flash IPL, which is far less painful… but also less effective. It took about three weeks to see the difference, but it was clear - the MeDioStar definitely cleared the hair better than the Dermo Flash. The Dermo Flash areas were slightly reduced in overall hair quantity, so I can’t say it didn’t work at all, but the MeDioStar area actually had some totally hair-free spots. There’s a visible difference. Jessica, the technician, was right when she told me that during my first treatment. That difference caused me to panic. What if the only option I had was MeDioStar? Could I handle it? Admittedly, I was sort of locked in regardless - I’d started and need to finish. I can’t go through life with this half-a-neck-full-of-hair thing I’ve got right now. The thought of several more MeDioStar experiences and that panic made me lose sleep. For about a week, I stressed about it hard. I went through the various stages of grief, pulling in to Acceptance on Friday. Saturday was the treatment so I popped a Vicodin I found in the back of a drawer and headed in. When I got there, I went into the treatment room and steeled myself for the worst. Jessica surprised the crap out of me when I got there, though: since I’d been there, they’d bought a new laser! This one was an IPL (intense pulsed light, not actually a real laser) like the Dermo Flash, but they’ve had much more success with coarse hair like mine using this one and - get this - it’s less painful than Dermo Flash. Less painful? And effective? Hell yeah. I actually heard Handel’s Messiah playing and saw light streaming down from the heavens. When you’re done, it feels a bit like a sunburn for a few hours, but even toward that evening the redness was going away and the sunburn feeling was dwindling. By the next morning, it was all better. It’ll take a couple of weeks before I can vouch for the effectiveness of it, but Jessica told me they had pretty good luck with it, and that builds my hope. I don’t think I’ll be totally done in just six treatments the way we originally thought, but that’s okay; if it’s working and it happens to take a couple of extra treatments, I’m cool with that.